Another photo-editor that gets a five-star rating? Yes indeed, this time for features, versatility, value and for finesse. 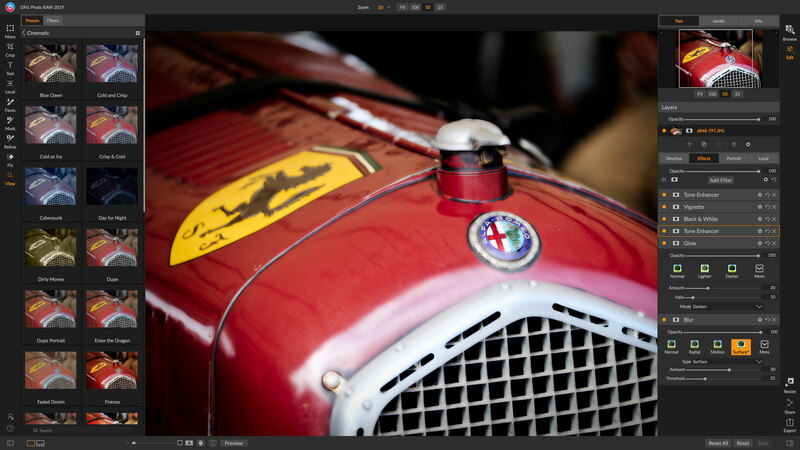 ON1 has brought Photo RAW 2019 a long way, not just improving the tools it offers but also the whole user interface and workflow experience. Definitely try it before you make your mind up, but it really is a genuine Lightroom/Photoshop rival which adds in a huge library of ready-to-use effects. 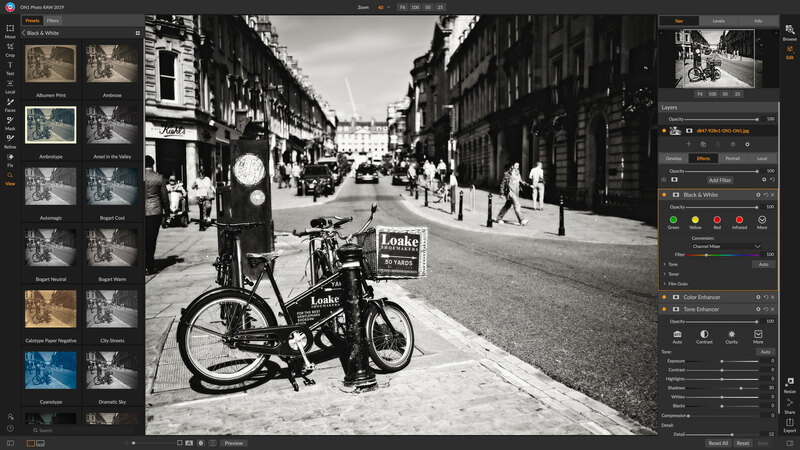 ON1 Photo RAW 2019 is a combined photo organising, editing and effects tool that is being pitched as a serious alternative to Lightroom and Photoshop. There’s still a lot of resistance out there to the idea of Adobe’s Photography Plan subscription model (even if it is a good deal! ), and ON1 is determined to use it. In fact, Photo RAW 2019 now includes a Lightroom migration tool which brings your existing folders and Lightroom Collections into ON1 Photo RAW, and even attempts to replicate image adjustments made in Lightroom, using AI to apply non-destructive ON1 Photo RAW adjustments to mimic the effect. Photo RAW 2019 isn’t just trying to replace Lightroom, though, as it also has Photoshop firmly in its sights. Normally, you’d need a non-destructive editing/cataloguing program light Lightroom for everyday jobs and a more powerful pixel-based editor like Photoshop for layered composites, complex selections, advanced features like photo stacking and so on. But ON1 Photo RAW 2019 has that covered too. It already offered layers, composites and masking tools via a separate Layers module, but this has now been integrated into the existing program’s non-destructive workflow so that you can create and manipulate layers at any time rather than having to migrate images to and from different modules. This is just one of a host of changes which make ON1 Photo RAW 2019 an extremely compelling ‘alternative’ photo editor. It’s not the only one. Alien Skin Exposure X4 does the same, concentrating on atmospheric analog effects but without advanced image compositing tools. ON1 Photo RAW offers its own analog ‘looks’, amongst others’, but is a much more fully-featured program that really does do practically everything you might want to do with photographs. So let’s take a closer look at what it does, how it does it, and whether ON1 Photo RAW 2019 is now the most compelling Lightroom/Photoshop alternative. 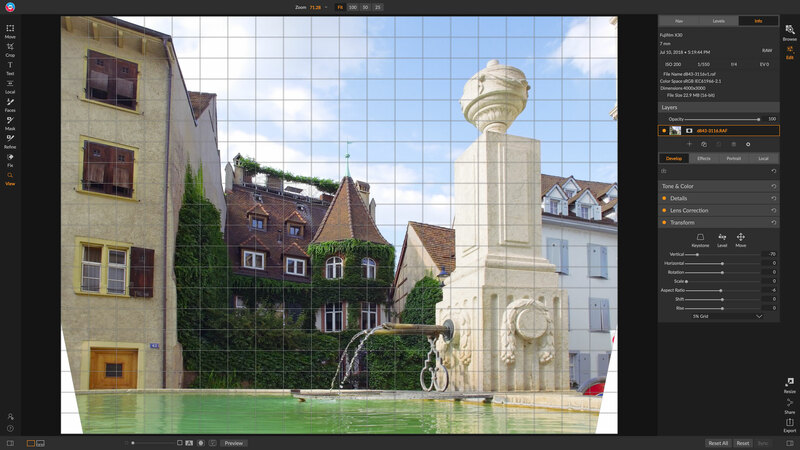 ON1 Photo RAW is both a regular photo editor and a powerful effects tool. It might be the only software you need. Let’s tackle this from a workflow perspective, so you’ll start off wanting to browse, search and organise your images. ON1 points out that, unlike Lightroom, it requires no Import process. This is true, so you can browse the contents of any folder on your computer. If you want to benefit from the full power of Photo RAW’s cataloguing and search tools, including Smart Collections, however, you’ll need to add them to your list of Catalogued Folders. This is pretty painless, so that if you organise all your image sub-folders within a single main image archive folder on your computer, Photo RAW will automatically scan all the sub-folders within it – and update its catalog when you add new ones. This does take a little while, especially if you’ve just installed the software and you’re adding a big image collection from scratch, but it happens in the backround and you can carry on working while it’s going on. 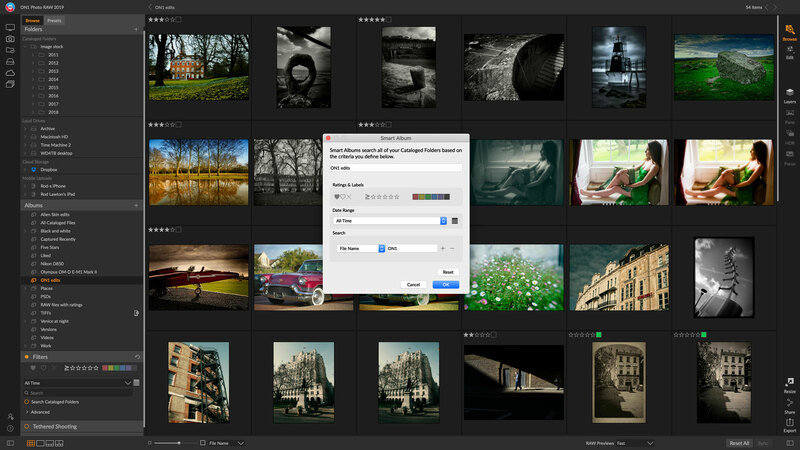 You can filter your images by rating, colour label and more, right across all your catalogued folders. Smart Collections are filled automatically with images that match your chosen search criteria. They can be as simple or as specific as you like – you can add multiple criteria. 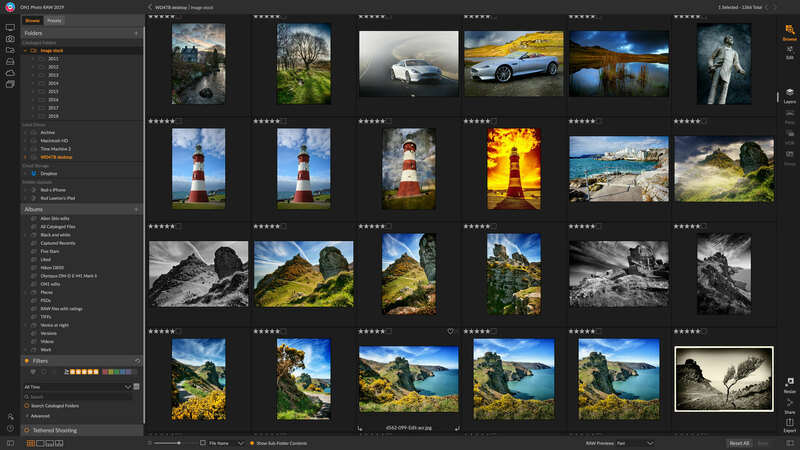 Like Lightroom, ON1 Photo RAW lets you browse your image folders and work directly with the files and folders on your computer, or you can create Collections and Smart Collections for gathering together related images ‘virtually’. In this version, ON1 has updated its keyword features so that you now get a Master Keyword List where you can check what keywords have been used, quickly find images that use those keywords, correct keyword mis-spellings, find and correct images with the wrong keyword and so on. For big photo collections (and keyword fans) this is a very useful addition in this new version. One of the key points about Photo RAW 2019 is that its adjustments are ‘non-destructive’. This means that it doesn’t change your original photos, buy stores your adjustments as processing ‘metadata’ (or processing instructions) alongside your photos. Inside Photo RAW 2019 it looks as if your images have been edited, but to produce an image with those processing changes permanently applied you have to export a new, processed image. This is how Lightroom, Capture One Pro, DxO PhotoLab and other new photo editing applications work. This non-destructive approach means you can change your mind about the settings at any time, even days or weeks later, and your original images are preserved intact and not altered. Not sure about the editing adjustments you want to try out? Then create a virtual copy – or lots of them – to compare different treatments. The other advantage of non-destructive editing is that you can create ‘virtual copies’ in ON1 Photo RAW that don’t produce duplicated image files on your computer. Instead, each virtual copy is the same original image but shown with different processing adjustments. You can produce finished, processed images by exporting these virtual copies. This system is unchanged from Photo RAW 2018, but ON1 has upgraded the whole image workflow to include all the image data in your RAW files and all the layered composite images you create into this non-destructive process. Previously, you had to process (or develop) a RAW file before you could work on it, while layers were handled in a separate module, which meant a lot of time-consuming module-swapping. By incorporating layers into its workflow, Photo RAW 2019 goes a whole step further than rival non-destructive browsing/editing tools. Other programs need to ’round-trip’ images to other editing tools like Photoshop or Affinity Phto to create composite, multi-layer images, but Photo RAW 2019 can do this internally. What’s more, if you want to replace a boring sky with a dramatic one, for example, Photo RAW 2019 even comes with a selection of skies you can simply drop into your photos. There are actually two ways of using layers. 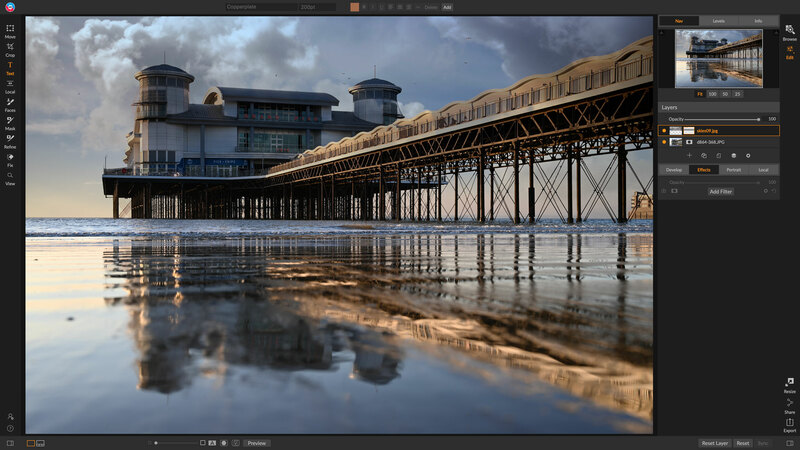 Photo RAW 2019 offers the equivalent of ‘adjustment layers’ for local adjustments where you want to modify the tones or colours of different parts of a scene, say. But as we’ve seen it also offers full image layers, where you can combine two or more photos. Now that layers are integrated into the Edit module, you can add and modify them really easily. In both cases you can use a brush or gradient mask tool to create the blend, together with automatic selections via a Perfect Brush option and a choice of blend modes, opacity settings and masks based on specific color ranges within the image. You can also create ‘luminosity masks’ based on brightness values. ON1 Photo RAW’s layering and masking tools can take a little acclimitisation if you’re used to Photoshop, but they are very effective. Be aware, though, that if you do create layered images then Photo RAW will need to create a new image file on your computer. These are still fully non-destructive, so you can keep changing the settings at will, but the files can be pretty big – 100MB+ for a two-layer 24-megapixel image, for example. 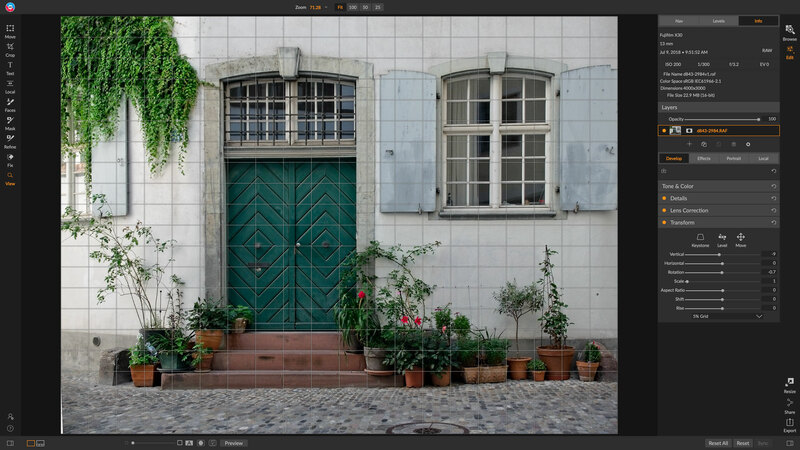 Does the integration of these layers tools make ON1 Photo RAW 2019 a genuine Photoshop rival? Actually, when you factor in its Develop and Effects tools (next section), then actually it does. Designers, illustrators and artists will have different needs not addressed here, but photographers may find that Photo RAW 2019 does everything they needed to use Photoshop for in the past. This layers integration is part of a workflow and interface overhaul designed to make ON1 Photo RAW 2019 more straightforward and effective than its predecessor. In the early days, ON1’s all-in-one program was a little complex and rough around the edges, but this latest version is a lot slicker – though all the changes have probably grown quite confusing for long-time users. Previously, the program had different modules arranged in a vertical list down the right side of the screen, but now there are only two: Browse and Edit. In the Edit mode, the previously separate modules have been integrated into a single, tabbed panel, so that all your work is now done in the same window. The Develop panel is used principally for RAW file enhancements and local adjustments (now with access to all the RAW data), though it can also be used for routine enhancements to colour, tone, sharpening and more for JPEG and TIFF images. You can also apply lens corrections (Photo RAW 2019 will automatically recognise and correct most lenses) and there’s a very useful Transform pane for fixing coverging verticals and other perspective issues. 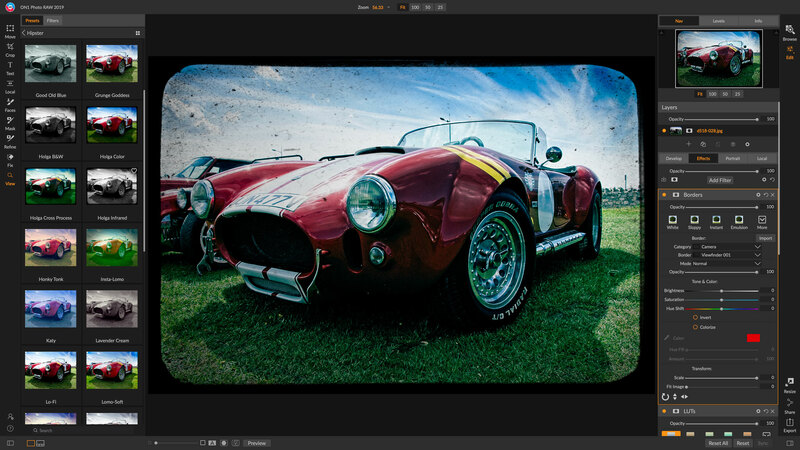 Alongside is the Effects panel, where you can apply Photo RAW’s extensive and growing list of effects filters. These don’t just include special effects, but more enhancements and adjustments beyond those in the Develop panel. Three new effects filters for curves, color adjustments and film grain, make these popular tools more easily accessible. In this latest version, ON1 has added three new dedicated filters: Curves, Color Adjustment and Film Grain. Curves and colour adjustments are available already, but only as sections within bigger and more complex filters, so this is ON1’s way of making these useful tools more accessible. The Film Grain filter offers a lot of presets and considerable control over the appearance of the grain, though it doesn’t erode edges in the way we’d expect real film grain to do, looking more like a granular ‘overlay’ than part of the image itself. 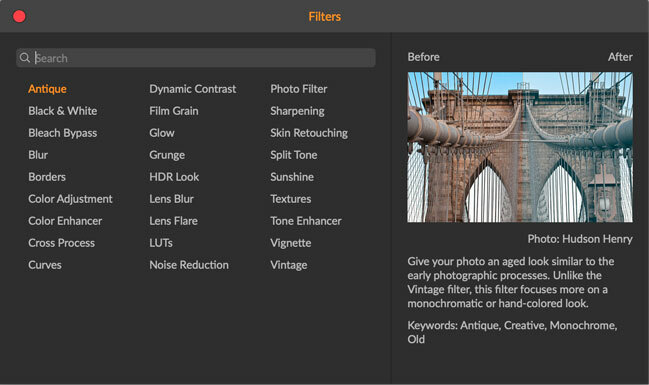 These filters are an integral part of ON1 Photo RAW 2019’s impressive capabilities, and they’re now easier to select thanks to mouseover previews and a clever little search field that lets you type in the effect you want to achive (for example ‘Detail’) so that you see a list of filters that offer this effect and a brief description of each. 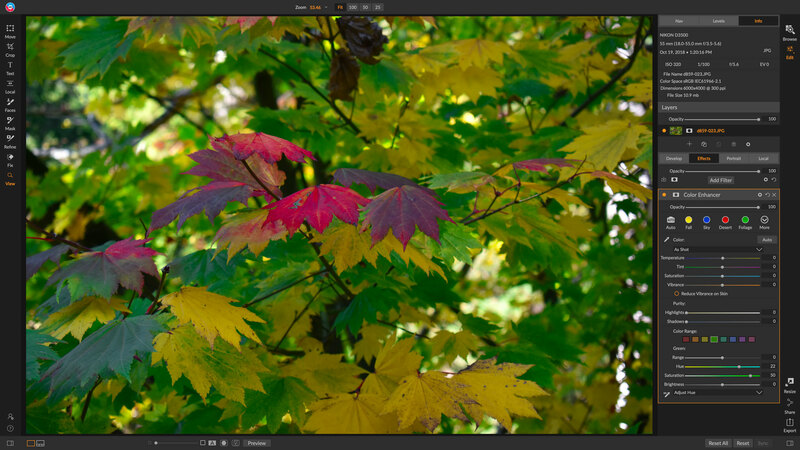 Given the complex and sometimes overlapping nature of ON1 Photo RAW’s filters, this is really useful to have. The program’s new Portrait panel deserves some attention too. It goes way beyond simple skin-softening, with an automatic face-recognition system that picks out and separates different faces in a shot so that you can edit them individually. Skin softening is easy thanks to the automatic face masking (you can modify the mask manually if you need to) and eyes and mouths can be enhanced using simple and adjustable marquee tools. It doesn’t do the kind of face morphing offered by Portrait Professional (for those who know that program) but not every portrait photographer is into that kind of adjustment anyway. There’s so much that’s new in ON1 Photo RAW 2019 that it would be easy to overlook what is perhaps its biggest strength – its library of preset image effects, organised into categories to help users choose exactly the kind of effect they want. Not sure what effects filter you need? The new filter panel previews each one with a short description – it even has a search box. Within each category each preset is previewed on a thumbnail version of the image you’re editing, and if you see one you like you can apply it with a single click. And if it’s not quite right, that’s fine, because each one is made up of a series of filters and adjustments which you can edit directly in the Edit panels. You can also save your own custom presets, either based on existing presets that you’ve tweaked to your liking or image effects you’ve created yourself from scratch. In this way, you can create your own library of preferred ‘looks’ which can save you countless hours of editing later when you want to use them again. Are you getting tired yet? We still have to mention a handful of further enhancements to ON1 Photo RAW 2019. These include a new Text tool which you can use to add captions, create personalised watermarks or even design posters. There’s a layered HDR workflow option now, too, where you can not only merge bracketed exposures into a high dynamic range image file, but create layered copies that let you blend different enhancements in different areas. Fans of macro photography will be excited to learn there’s a new Focus Stacking option that lets you choose the depth of field you want with a slider, and an auto-align-layers feature that’s perfect for merging multiple exposures, for example – ON1 demonstrates this with a multi-shot image of a snowboarder against a static background. The new Transform tools in the Develop panel are another major addition in ON1 Photo RAW 2019. ON1 Photo RAW has always been big on value, feautures and spectacle, but it’s lacked some of the finesse of big name rivals like Lightroom, Capture One and Alien Skin Exposure, for example. ON1 Photo RAW 2019 really turns that around. Its interface is now a calmer and more elegant place to work, and its workflow changes improve both the quality of the outcome and the experience of using the software. Integrating layers into the non-destructive workflow and the preservation of RAW data in local adjustments and layers are two major steps forward. On top of that, ON1’s continued refinement of its Effects filters and the way they’re presented make you realise these are important creative tools that deserve to be taken seriously – sorry, ON1, but previously, they had a distinctly ‘tacky’ look. The interface and workflow changes alone have elevated ON1 Photo RAW 2019 into a much more serious-looking product. On top of that, there are new Transform tools, new Portrait tools, the Text tool, Focus Stacking, auto layer alignment and a layered HDR workflow. ON1 Photo RAW 2019 sets out to do everything that Lightroom and Photoshop can, but in a single window and without a subscription. This is a big, big upgrade. Very often, it’s difficult for existing users to decide whether they should pay to upgrade to the new version of their software (so maybe subscriptions make sense after all, huh? ), but in this case there can’t be any doubt. Even if you’re already using ON1 Photo RAW 2018, itself massively improved over its predecessor, this is better still. For those still deciding on what software to invest in, ON1 Photo RAW 2019 is a serious contender as the best value, and arguably most powerful, all-in-one photo editing solution on the market. Other programs have their strengths – Alien Skin Exposure X4 for its analog effects, DxO PhotoLab for its sublime RAW conversions, Capture One Pro for its quality and editing workflow – but no other program gives you this kind of power for this kind of money. But look, you don’t have to pay up front to find out because you can download the ON1 Photo RAW 2019 free trial. ON1 Photo RAW 2019 is available right now and costs $119.99 for new users or $99.99 for existing users*, though do check for special deals and promotions. You can find out more and download the free trial here. *If you are a current or previous owner of any ON1 product, you qualify for upgrade pricing. Older ON1 apps do not have to be currently installed.